Location Harkerside Low Lane below Whitbecks. Geology Edge of late glacial lake terrace. Record Description Relict hedgerow with laid wych elms all now long dead from Dutch Elm Bark Beetle disease. This photograph shows Andrew Fleming and Oliver Rackham, who had come from Cambridge, examining the hedgerow elms and was taken during the initial survey of the ancient wych elm pollards of Swaledale. 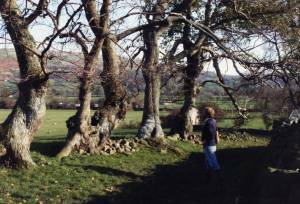 These ancient wych elms had then only just been recognised by Andrew Fleming. The first of these ancient wych elm pollards to be recognised (recognised by Andrew in my presence) was located by the right of way at Ewelop Hill, east of Fremington. (For the present state of this Wych Elm Pollard at Ewlop Hill, see swaag database site no ). 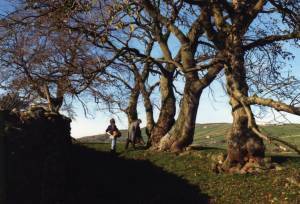 Additional Notes These two 'historic' photos show wych elm trees which have now long since been cut up for firewood illustrate the importance of making a record of the mature landscape trees of all species which are so significant in the historic and present day Swaledale landscape. Image 1 Description Andrew Fleming examines the relict laid hedgerow wych elm tree at Low Lane, Whitbecks. Image 2 Description Andrew Fleming and Oliver Rackham, author of many works on Trees including 'Woodlands' the 100th Volume in the Collins New Naturalist Series, examine the relict laid hedgerow wych elm tree at Low Lane, Whitbecks.